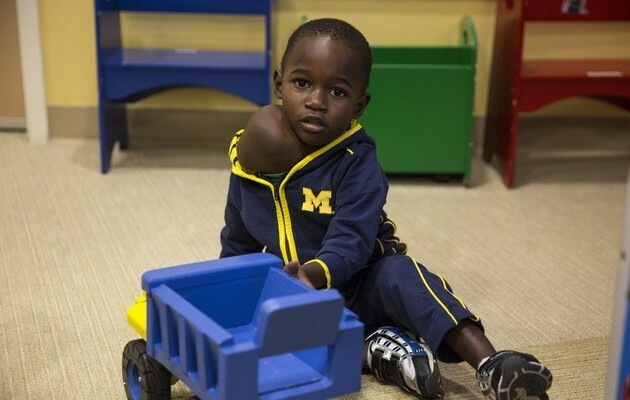 The grapefruit-sized tumor draped around Jonathan Ssekawunde’s neck didn’t keep the rambunctious 3-year-old from hopping on tractors for pretend “rides,” darting through a barn and giggling while feeding goats and llamas at Domino’s Petting Farm this fall. But back home in his village in Uganda, Jonathan wasn’t able to play in public places. There, the protruding tumor marked him as “diseased,” leading to his isolation from other children and even preventing him from going to school. Today, just a faint, pencil-thin line across his neck is all that’s left of the 18-centimeter neck mass after a surgery at the University of Michigan’s C.S. Mott Children’s Hospital. Naomi Corera, of Ann Arbor-based foundation “Children Waiting Everywhere,” vividly remembers meeting the high-spirited toddler on a trip to Uganda last year. He sprinted towards her as she passed out balloons at a home for children with disabilities run by the Sisters of the Good Samaritan. She learned that Jonathan, who was born a twin but whose brother didn’t survive the birth, had a bean-seed sized growth behind his ear as a newborn. As he grew, it grew. So Corera embarked on a passionate quest to find him help, collecting his medical records and bringing his case to Ann Arbor. Jonathan’s story reached Mott pediatric otolaryngologist Dr. Marci Lesperance. “I had never seen a neck mass this large in my entire practice. Had Jonathan been born here, this would have been taken care of at a much earlier stage,” Lesperance says. Thanks to Corera’s foundation, donors and a host family, Jonathan was able to take that chance in October. A year after meeting Corera, Jonathan’s mother Jane left her two older boys at home to make the trek to Ann Arbor with Jonathan, along with their translator Sr. Mbabazi Josephine. Once in Michigan, Jonathan was evaluated by doctors who deemed him otherwise healthy. But an MRI revealed newfound concerns: As suspected from the low position in the neck, the lesion extended down under Jonathan’s chest, displacing his lungs. Although medical reports from Africa suggested that the mass was cystic and filled with fluid, the MRI showed a large solid component that appeared to be infiltrating and invading the deep tissues. These MRI findings raised concern for cancer, which could mean that surgery alone would not be enough. Jonathan’s case was reviewed by a team of adult and pediatric otolaryngologists, pediatricians, a radiologist, a pathologist and the hospital’s tumor board. Doctors determined that while still risky, the surgery was possible. The procedure required five surgeons in the room, aided by an ICU team, pediatric anesthesiologist and hematologist. U-M’s head and neck mass specialist Dr. Matthew Spector started the procedure with a biopsy, which determined that the tumor was indeed benign. He then carefully separated three major blood vessels under the belly of the tumor in order to work around nerves affecting Jonathan’s motor functions like arm movement. Blood volume for Jonathan’s entire 34-pound body was replaced twice during the six-hour surgery. “The biopsy confirmed the diagnosis and that what we were doing was right for Jonathan,” Spector says. “It went as well as we could have hoped and it was wonderful being able to deliver that news to his mother. Just 10 days after the surgery, Corera traveled with the family back to Jonathan’s village where he was greeted by celebratory songs, cheers and chants during a jubilatory reunion with his father, siblings, friends and neighbors. Naomi Corera, thanks for being a good Samaritan. The University of Michigan’s C.S. Mott Children’s hospital, Dr. Spector and the entire ICU staff, you all make the world a much better place to be. Blessings. Oooo we love everything about this joyful story. The generous noami corera who spotted that cute little Jonathan and the amazing and gracious team at Mott Michigan university hospital! Total joyousness indeed! Bless!